(10-26-2018, 09:02 AM)rich2005 Wrote: As far as I know OpenOffice does(did) not have an export-to-PDF feature. However LibreOffice for the 8 year old 'buntu Lucid might not have it either. There is a PPA: for installing see: https://launchpad.net/~garhuy/+archive/u...-lts-lucid at least it is only 4 years old. A big application and assuming yours is an older computer might not be the best choice. Do you have ImageMagic installed, again it will be an older version 6.1.5 but if there worth a try. Along the lines of; Put the 2 image files (say png's) in a empty folder. Open a terminal in that folder. Use the command. Ok, I used the convert application and it also generated a pdf with 591x984 100 dpi images! 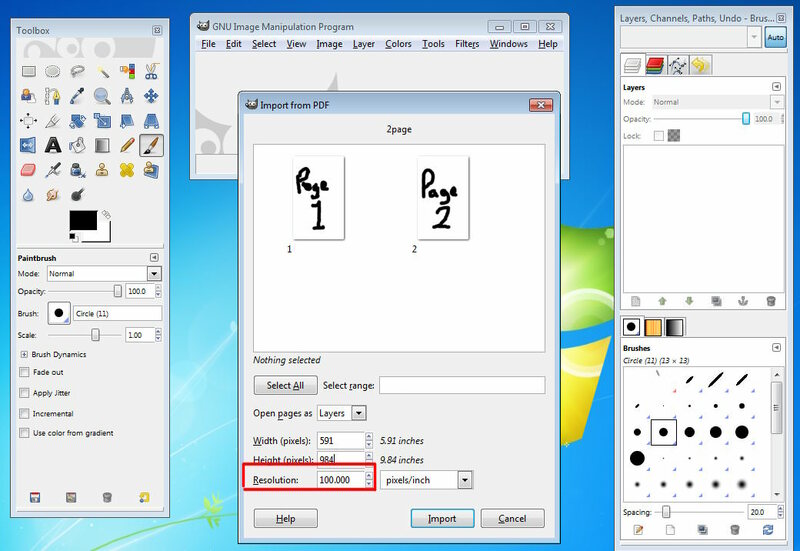 Using pdftoimage with the pdf produced by jpg2pdf, I end with two .jpg of size 1182 × 1969 and 72dpi. 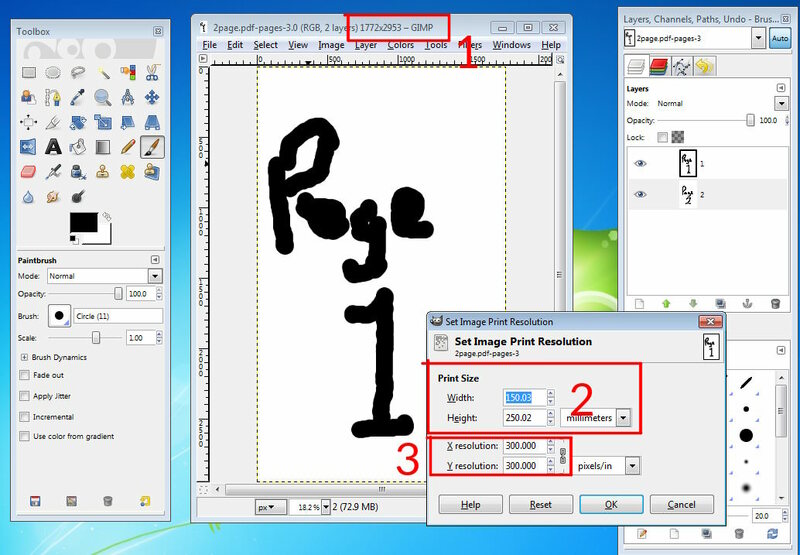 Using it on the pdf produced by convert was the same, although the space occupied by both were slightly different, but the dimensions and dpi were the same. Their print size is crazy, 16.417 x 27.438 inches! The print size inside both pdf is 5.9 x 9.840 inches. The original 3000 pixel images have a print size of 5.907 x 9.844 inches. I do not have ImageMagic. Shall I go after ImageMagick first? Quote: Ok, I used the convert application and it also generated a pdf with 591x984 100 dpi images! Quote: Their print size is crazy, 16.417 x 27.438 inches! The print size inside both pdf is 5.9 x 9.840 inches. The original 3000 pixel images have a print size of 5.907 x 9.844 inches. Quote: I do not have ImageMagic. Shall I go after ImageMagick first? and the resulting pdf was stil a 591x984 with 100dpi. Installed libreoffice did what you said and the resulting image was a 590x985. On top of that, it was a single image pdf, since when I open the second image it overrides the first one. It seems all the programs are generating the same size images. Perhaps it is right and now that is being used correct source images with 300 dpi source, it will be correct? I will do a test soon. Quote: and the resulting pdf was stil a 591x984 with 100dpi. No, you are still confused about image size in pixels and printing resolution. Did you not read when I wrote you can have the PDF at any ppi (dpi for printing) How are you opening the PDF? What application are you using? Are you using Gimp 2.6? Quote: Installed libreoffice did what you said and the resulting image was a 590x985. On top of that, it was a single image pdf, since when I open the second image it overrides the first one. Create a page size, 15 cm x 250 cm with zero borders. Quote: It seems all the programs are generating the same size images. Perhaps it is right and now that is being used correct source images with 300 dpi source, it will be correct? I will do a test soon. You are looking at them in the same way which is why you see 591x984 with 100dpi. The important bit is the pixel size of the image encapsulated in the PDF. Large image in pixels = good quality small image in pixels = not so good. 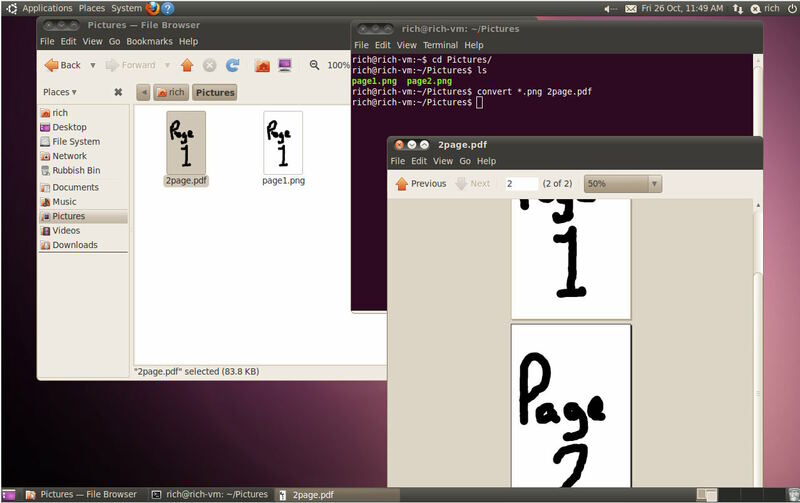 Gimp works in pixels but you can print the image at any ppi resulting in different real world sizes. 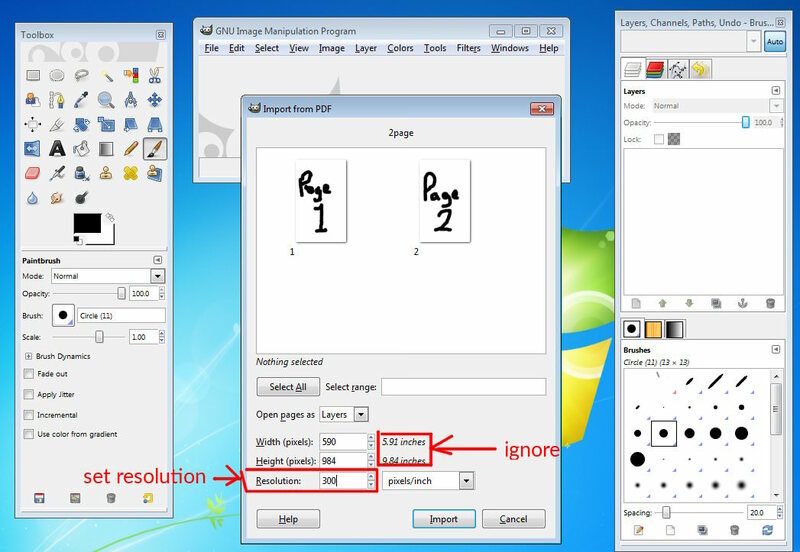 A PDF is a universal format, In Gimp will always open at a default resolution of 100 ppi. Up to you to specify the ppi. Although I do not know if you are using your Gimp 2.6 for this. Trying another way of looking at the 2 page PDF. Using ImageMagick convert command. If the image was scaled down during the creation of the PDF it would be much smaller. Of course that is a simplistic example, some applications might take a png, convert to a jpg and come up with a smaller PDF but like-for-like the PDF size is the sum of the image sizes. You can do as many tests as you like but until you understand the relationship between pixel size and printing pixels-per-inch you will keep getting the same outcome. Still trying to explain. I have to use a Gimp 2.6 in a Widows VM, Not able to install in Ubuntu 10.04, some required libraries were pulled a couple of years ago. Use your 1772 x 2953 @ 300 ppi - that is the correct size for a 150 mm x 250 mm print size. Use ImageMagick convert without the -density switch, I might have had it in the wrong place.